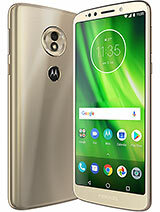 The Motorola Moto G6 Play is equipped with 1.4GHz octa-core Qualcomm MSM8937 Snapdragon 430 processor and 1.4 GHz quad-core Qualcomm MSM8920 Snapdragon 427 processor for the USA. The phone comes with 2/3 GB memory and 16/32 GB internal memory which can be expanded up to 256 GB via microSD. The Moto G6 Play runs Android 8.0 (Oreo) and the price is 200 EUR. It packs a non-removable Li-Ion 4000 mAh battery with fast battery charging 10W or 15W. The Moto G6 Play boasts of 13 megapixels rear camera with phase detection autofocus, and LED flash. The smartphone has an 8-megapixel front camera for selfies and video calling. It is a single and dual nano-sim smartphone (dual stand-by). The smartphone comes in four colors (Deep Indigo, Silver, Flash Gray, Gold). It has a 5.7-inch touchscreen display with Corning Gorilla Glass protection. The phone’s screen resolution is 720 x 1440 pixels at a PPI and 18:9 ratio. The phone supports connectivity options include Wi-Fi, GPS, Bluetooth, NFC, USB OTG, 3G, and 4G. The smartphone dimensions 6.08 x 2.84 x 0.35 inch and weight is 175 g (6.17 oz).